Rice is harvested in much the same way as other cereal crops. Care must be taken not to shatter the hull and risk losing some of the grain. Combines designed for wheat harvest (described later in this chapter), as welt as sickles and knives, may be used for harvesting rice. However, tools designed by CeCoCo in Japan are specifically for rice harvest and are described as follows. This is an adjustable, hand-pushed rice cutter which promises to make the work of men, women, or children five times faster than when using a hand sickle. A 20-inch wide cradle collects the stalks as they are cut. This tool will reap slightly more than Vio acre per hour. The blade is easily detached for cleaning and sharpening. The operator uses both arms to power this toot and stands in an almost erect position. This technique is easy on workers and gives them the power to easily cut through stalks, even thick-cropped rice plants, leaving them grouped and ready for sheaves. C. E. RUHMANN MFG. CO., INC.
T. & G. HUTTON & CO.. LTD.
W. TYZACK SONS 8: TURNER, LTD. This is a lightweight tool designed to cut wheat or rice stalks at a rate of i/A acre per hour. It is made of steel pipe and is powered by a li/2 h p., air-cooled engine. The reciprocating mower is a high-speed machine which has largely superceded the scythe for cutting grass and forage crops, even for small acreages. Cutting close to the ground, it is especially valuable for harvesting badly laid cereal crops. Avoiding the chopping and shredding action of forage mowers, reciprocating mowers do not disturb the kernel or separate it from its husk. Left intact, threshing and cleaning procedures can be saved until a convenient time after the crop is safely delivered to the barn. The cutting mechanism of a reciprocating mower. can be either an animal-drawn or ground-driven machine, have its own power unit (motor mower), or be a front end or side attachment for a two- or four-wheel tractor. When animal-drawn, the large land wheel rotating on the ground as the animal draws the machine forward provides the power to operate the mower knives through the gearbox and the pitman. For the tractor-drawn types, the power to operate the machine is obtained from the tractor engine. 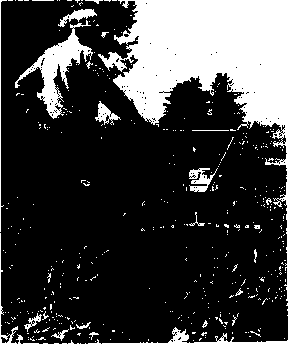 The tractor-drawn mower can be hitched to the tractor in a number of ways.